DURHAM, N.C. -- Engineers and neuroscientists at Duke University have developed a method to measure the response of an individual neuron to transcranial magnetic stimulation (TMS) of the brain. The advance will help researchers understand the underlying physiological effects of TMS -- a procedure used to treat psychiatric disorders -- and optimize its use as a therapeutic treatment. TMS uses magnetic fields created by electric currents running through a wire coil to induce neural activity in the brain. With the flip of a switch, researchers can cause a hand to move or influence behavior. The technique has long been used in conjunction with other treatments in the hopes of improving treatment for conditions including depression and substance abuse. While studies have demonstrated the efficacy of TMS, the technique's physiological mechanisms have long been lost in a "black box." Researchers know what goes into the treatment and the results that come out, but do not understand what's happening in between. Part of the reason for this mystery lies in the difficulty of measuring neural responses during the procedure; the comparatively tiny activity of a single neuron is lost in the tidal wave of current being generated by TMS. But the new study demonstrates a way to remove the proverbial haystack. The results were published online June 29 in Nature Neuroscience. "Nobody really knows what TMS is doing inside the brain, and given that lack of information, it has been very hard to interpret the outcomes of studies or to make therapies more effective," said Warren Grill, professor of biomedical engineering, electrical and computer engineering, and neurobiology at Duke. "We set out to try to understand what's happening inside that black box by recording activity from single neurons during the delivery of TMS in a non-human primate. Conceptually, it was a very simple goal. But technically, it turned out to be very challenging." 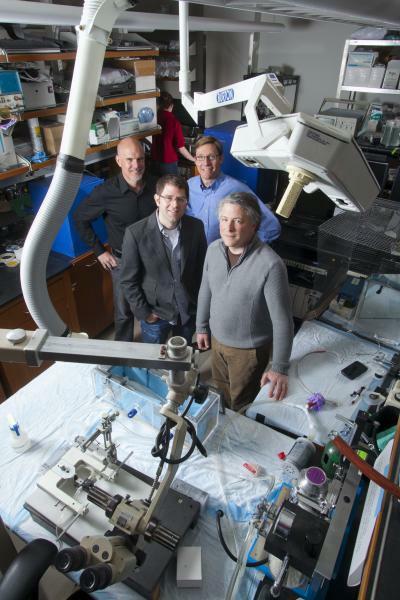 First, Grill and his colleagues in the Duke Institute for Brain Sciences (DIBS) engineered new hardware that could separate the TMS current from the neural response, which is thousands of times smaller. Once that was achieved, however, they discovered that their recording instrument was doing more than simply recording. The TMS magnetic field was creating an electric current through the electrode measuring the neuron, raising the possibility that this current, instead of the TMS, was causing the neural response. The team had to characterize this current and make it small enough to ignore. Finally, the researchers had to account for vibrations caused by the large current passing through the TMS device's small coil of wire -- a design problem in and of itself, because the typical TMS coil is too large for a non-human primate's head. Because the coil is physically connected to the skull, the vibration was jostling the measurement electrode. The interdisciplinary team that developed the method to record an individual neuron's response during transcranial magnetic stimulation. Clockwise from top left: Michael Platt, director of the Duke Institute for Brain Science, Center for Cognitive Neuroscience; Warren Grill, professor of biomedical engineering, electrical and computer engineering, and neurobiology; Marc Sommer, associate professor of biomedical engineering and neurobiology; and Tobias Egner, assistant professor of psychology and neuroscience. The researchers were able to compensate for each artifact, however, and see for the first time into the black box of TMS. They successfully recorded the action potentials of an individual neuron moments after TMS pulses and observed changes in its activity that significantly differed from activity following placebo treatments. Grill worked with Angel Peterchev, assistant professor in psychiatry and behavioral science, biomedical engineering, and electrical and computer engineering, on the design of the coil. The team also included Michael Platt, director of DIBS and professor of neurobiology, and Mark Sommer, a professor of biomedical engineering. They demonstrated that the technique could be recreated in different labs. "So, any modern lab working with non-human primates and electrophysiology can use this same approach in their studies," said Grill. The researchers hope that many others will take their method and use it to reveal the effects TMS has on neurons. Once a basic understanding is gained of how TMS interacts with neurons on an individual scale, its effects could be amplified and the therapeutic benefits of TMS increased. "Studies with TMS have all been empirical," said Grill. "You could look at the effects and change the coil, frequency, duration or many other variables. Now we can begin to understand the physiological effects of TMS and carefully craft protocols rather than relying on trial and error. I think that is where the real power of this research is going to come from." The light grey coil on the left is a conventional, commercially available TMS coil. The black coil on the right is the new, innovative version designed to fit a smaller non-human primate's cranium and work with the neural monitoring device.